Here are a few handful of companies whose stocks may not sink further if stock market correction goes on some more time. But these are the stocks to bounce back if stability returns in markets. And so these could be the best stocks to buy now. 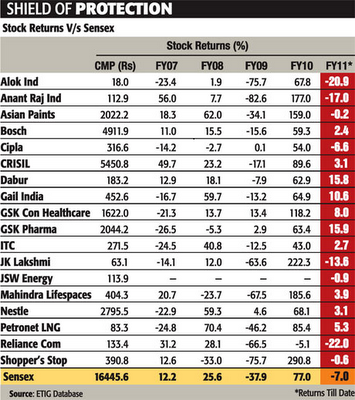 This is a list of stocks recently published by ET Investor's guide. The logic remains true if European financial crisis gets resolves in near future. If it grows comparable to the levels of financial crisis in 2008, stock markets could sank further negating the possibilities. The reasoning and stock analysis/sector analysis of each company mentioned here is available in each of the links below. Its a great thing that now most are interested on investing on penny stocks.